Bishop School Spring Musical 2014: Honk, Jr.
We are delighted that our director this year was Michelle Mount, a licensed theater educator with a broad range of experience directing children's theater productions, teaching acting and public speaking in Arlington, Boston, Cambridge, and Newton. 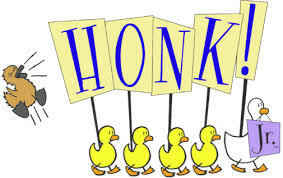 A contemporary adaptation of Hans Christian Andersen's The Ugly Duckling, HONK! Jr. follows "Ugly" whose odd, gawky looks instantly incite prejudice from his family and neighbors. Separated from the farm and pursued by a hungry Cat, Ugly must find his way home, with only his loving mother 'Ida' searching for him. Along his harrowing yet hilarious journey, he not only discovers his true beauty and glorious destiny, but also finds love and acceptance in all its forms.